The First World War was a transformative experience for women, facilitating their entry into new spaces and alternative spheres of activity, both on the home front and on the edges of danger zones in Europe and beyond. The centenary of the conflict is an appropriate moment to reassess what we choose to remember about women’s roles and responsibilities in this period and how women recorded their experiences. It is timely to (re)consider the narratives of women’s involvement not only as nurses, VADs and mourning mothers, but as pacifist campaigners, poets, war correspondents and contributors to developing genres of war writing. This interdisciplinary volume examines women’s representations of wartime experience across a wide range of genres, including modernist fiction, ghost stories, utopia, poetry, life-writing and journalism. Contributors provide fresh perspectives on women’s written responses to the conflict, exploring women’s war work, constructions of femininity and the maternal in wartime, and the relationship between feminism, suffrage and pacifism. 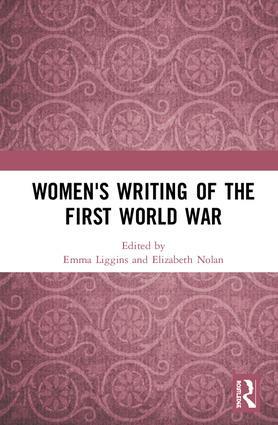 The volume reinforces the importance of the retrieval of women’s wartime experience, urging us to rethink what we choose to commemorate and widening the presence of women in the expanding canon of war writing. This book was originally published as a special issue of Women’s Writing. Emma Liggins is a Senior Lecturer in English at Manchester Metropolitan University, UK. She is the author of Odd Women? Spinsters, Widows and Lesbians in British Women’s Fiction, 1850s-1930s (2014) and a chapter on May Sinclair and women’s war work in May Sinclair: Re-Thinking Bodies and Minds, eds. Rebecca Bowler and Claire Drewery (2016). Elizabeth Nolan is a Senior Lecturer in English at Manchester Metropolitan University, UK. Her publications include ‘American Women’s Writing of the First World War’ in Literature Compass (2007), ‘The Awakening as Literary Innovation: Chopin, Maupassant and the Evolution of Genre’ in The Cambridge Companion to Kate Chopin (2008) and ‘The Woman’s Novel Beyond Sentimentalism’ in The Cambridge History of the American Novel (2011).